Why Does My Long Haired Cat Need Special Litter? Dr. Elsey’s Long Haired Litter is safe and healthy for your cat. 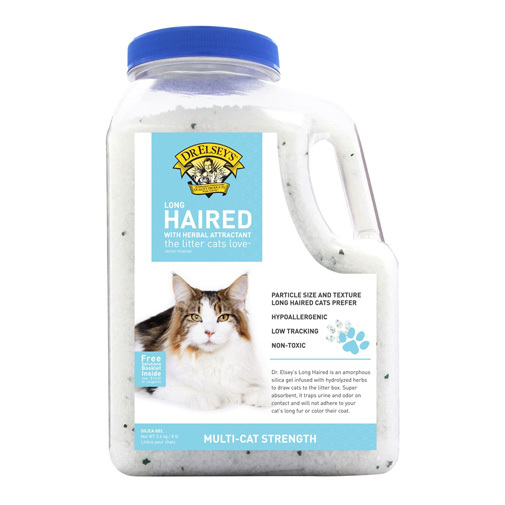 Dr. Elsey’s Long Haired Litter is an amorphous silica gel infused with hydrolyzed herbs to draw cats to the litter box. Long Haired Litter traps urine and odor on contact and has the right particle size that long haired cats prefer. Long Haired Litter will not adhere to the cat’s long fur and it will not color the coat. Each jug contains a free Litter Box Solutions Booklet.